January | 2011 | Larval Subjects . Somewhere or other Henry Louis Gates says something like “racism is a failure of the imagination”. I’m not sure why I find myself meditating on this aphorism this evening, except for the fact that such failures of the imagination seem to be at the heart of much human cruelty and evil. Not only is there the common inability to imagine the psychic life of other persons and creatures, but there is also the inability to imagine their circumstances. The Gestalt theorists teach us about the relationship between foreground and background that is characteristic of every phenomena. Background withdraws. I see another person, reduce them to foreground, and then think them in analogical terms to my own life and circumstances. For example, during the heat wave in France a couple years ago Elizabeth Hasslebeck wondered why people didn’t just turn on their air conditions. During Hurricane Katrina others wondered why people just didn’t get a cab out of the city (seriously, I heard many people say things along these lines here in Texas). Yet others described the behavior of people as looting, rather than as desperate attempts to fight starvation and dying of thirst. These are instances of analogical thinking and are failures of imagination. In many respects, one of the highest vocations of the social theorist and scientist is to fight failures of imagination by rendering imagination possible for others through their research. Among other things, social theorists and scientists bring worlds into relief. They help that which is otherwise withdrawn to be brought out of withdrawal so that others might see. This is one of the things that great art can accomplish as well. Great art can function as a sort of window allowing us to enter the worlds and subjectivities of other people, allowing us to walk with them as they walk and have lived. As such, it creates imagination. Part of the study of ethics consists not simply in the study of ethical philosophies, but in the study of art, literature, poetry, and well-written history so as to encounter that which is withdrawn through allusion. As Alex Reid argues today, the field of ethics is relational, yet nonetheless is a relationality with that which is withdrawn. Social theorists, scientists, and artists are great cartographers of fields of relation or circumstance, creators of allusion to that which can never be directly experienced, and constantly remind us of the withdrawal of other humans and creatures. That is, they endlessly combat analogical thought which leads to thoughtless cruelty and evil. I am not adopting the stance of the beautiful soul here, suggesting that if only we understood the world would suddenly be filled with peace and love. Of course, imagination certainly doesn’t hurt in promoting peace and love. There are real antagonisms in the world and these can’t be erased simply through imagination. Nonetheless, failures of imagination intensify these antagonisms even more. Gallagher’s translations of a number of Lacans unpublished seminars can be found for free here. Enjoy! Every once in a while you come across a concept that puts in words something that’s been on the tip of your tongue for years but which you’ve never quite been able to articulate. Ian Hacking’s concept of interactive kinds is, for me, an example of such a concept. In his discussion of social construction talk in The Social Construction of What?, Hacking is careful to emphasize that such talk generally refers to the construction of our categories (kinds), not the individuals or entities that are grouped under these categories. It is not, for example, my cat Tabby that is constructed, but the kind or category “cat”. What is interesting here is not the construction of categories or kinds themselves, but rather the relationship between the constructed kind and the entities that fall over them. Hacking distinguishes between two different kinds: indifferent kinds and interactive kinds. In the case of indifferent kinds, the entity or individual falling under the kind is indifferent to the categorization that, for lack of a better word, names the entity. Take the example of trees. In his Prolegomena to Linguistics, Hjelmslev teaches us, in good nominalist fashion, to discern how different languages classify trees and shrubs in different ways (cue Monty Python). What is classified as a tree in one language might be classified as a shrub in another language. The important point, however, is that the entities being so classified are indifferent to the classification. The classification makes no difference to them. This doesn’t mean the entities are passive. Plants are active in all sorts of ways. It only means that plants take up no stance with respect to how we classify them. But still, this idea that Derrida was never invested in creating his own philosophical positions seem to either come from too narrow of a reading of Derrida, or too narrow of an idea of philosophy, or both. If you look at the ‘late’ Derrida, he is clearly trying to work out ideas of cosmopolitanism, friendship/fraternity, and hospitality. Frequently in a non-anthropocentric register. He did so both through recourse to other texts, but also through a profound number of insights of his own that were not mere textual glosses. I haven’t read most of the posts in the current round of Derrida debates, but I was surprised by James’ remarks here. Are people really claiming that Derrida develops no philosophical position or that he only gives textual glosses? I’ve never thought such a thing. It’s always seemed to me that Derrida is making rather strong philosophical claims. To me it seems that Derrida’s core thesis is that reality is structured by the signifier for humans. At the heart of this claim are the two central theses of structuralist linguistics that 1) signifiers are differentially constituted (hence all the stuff about differance and the trace), and 2) that signifiers only refer to other signifiers. As Lacan articulated the latter point, “the signifier represents the subject for another signifier”. Within this framework, then, the referential function is undermined as language only refers to language, never to world. Derrida constantly explores the limits of language– hence his interest in Levinas –but only, it seems to me, as opening on to an Other that exceeds all possibility of being articulated in language. Methodologically, the conclusion that follows from this is that talk about the world can only ever be talk about talk or language. This can take the form of the analysis of texts, of speech, of the semiotics of clothing, etc. But working in the background is always the thesis that reality is a signifying construction. To talk about an object such as the telephone on my desk is thus not to talk about my telephone, but about a signifying construction (here reference should be made to Derrida’s discussions of manifestation and phenomena vis a vis Peircian semiotics in Of Grammatology). So sure, Derrida talks about hospitality, cosmopolitanism, friendship/fraternity, etc. (whoever suggested otherwise), but isn’t this always on the horizon of a nominalism where reality is linguistically constructed and where we are inextricably trapped within language? Put a little bit differently, of course Derrida talks about objects all the time (coins, cats, dogs, weapons, etc), but he can do this because all of these objects are texts. His dialectic thus unfolds perpetually around a play between the trace of an Other perpetually withdrawing from language and unreachable and the text of being that’s a signifying construction. One operation consists in demonstrating how attempts to fix reference or presence are always undermined by the play of the signifier (“Parergon”, his reading of Kant’s third Critique is an exemplary example of this), while the other operation consists in marking the place or site of the always undetermined Other (the gift might take place, but if it does it will always be an event that takes place behind our backs, that can’t be anticipated, that can’t be known if it does happen, and that can’t be pinned down). The former operation ceaselessly reveals the manner in which signifier refers to signifiers, rather than a transcendental signified (a concept, form, essence, or universal apart from language) or referent (entities that exist independently of language). As a consequence, manifestation or phenomenality is an effect of this differential play of language or the signifier, not a being apart from language itself. The caveat, of course, is that there is always the possibility (which is simultaneously impossible) of a withdrawn Other. This really isn’t what Derrida is arguing? Ian has written an interesting post discussing computer languages. Here he’s riffing on Morton’s post discussing whether or not computer language should be taught in humanities departments. All of this brings to mind Guattari’s idea of “a-signifying semiotics”. Over the last couple of years I’ve become increasingly critical of the focus on meaning or signification in the humanities and social and political thought. My point is not that meaning and signification aren’t important components of the social world, but only that they are only components or part of the story. This is the point, in part, that I was trying to convey in my recent post on relation. There the idea was that there are all sorts of entities that bring people together and organize social relations that aren’t directly about meaning. Meaning plays a role, but it isn’t the entire story. However, within the framework of much social and political thought and humanities, the implicit thesis seems to be that it is meaning that holds society together. The glue of society, as it were, is meaning or signification. Take the example of Zizek. For Zizek, it seems, the social world is held together by ideas (ideology). This is why, in his work, critique of ideology is ground zero of political engagement. There the social relations that exist are the result of the ideas or ideology that holds the social together. If you wish to dissolve or change these relations you must dissolve the ideas. My point is not that things such as ideology aren’t a part of that glue, but that there are many other factors besides and that we need to attend to these factors. 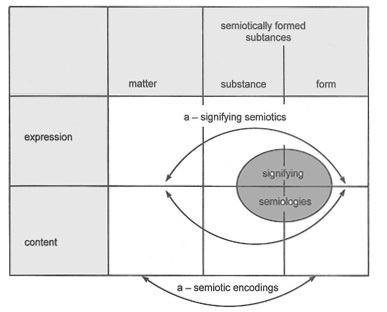 Returning to the discussion of computer languages, Guattari’s concept of a-signifying semiotics would be an example of extra-signifying factors that play a role in forming social relations. If I understand Guattari correctly (and I always find him challenging) when he evokes a-signifying semiotics he is referring to forms of operation that manipulate elements in ways that do not involve signification or meaning. The way in which DNA and RNA interact would be an example of, for Guattari, an a-signifying semiotic. However, of greater interest to those of us engaged in social and political thought would be the role that computers increasingly take in our lives. Take the example of book recommendations on Amazon or personalized radio stations such as Pandora on the iPhone. These things function not through signification or meaning, but through a-signifying semiotics. The way in which they select books that you might be interested in or music that you would probably like is through a computer algorithm that has nothing to do with meaning but which, rather, calculates probabilities based on what others have bought and listened to. Other examples of a-signifying semiotics would be the manner in which grocery store purchases are used if you make your purchases using discount cards, credit card ratings, the way your social security number functions in computer banks, etc. Meaning and signification, of course, gets imbricated in these a-signifying semiotics when we encounter their results, but these operations do not in and of themselves function according to meaning or signification. In the contemporary world, a-signifying semiotics play a growing role in sorting and structuring the destinies of human lives, in forming communities or groups of individuals (Amazon’s book recommendations play a role in forming something like a community of readers with a shared hermeneutic horizon), in bringing people together in particular ways, and in enabling and preventing certain forms of association (all sorts of things are rendered possible or impossible based on credit card ratings). There is a rich domain of research to be done in how operations that proceed through a-signifying semiotics play a role in organizing social relations. So long, however, as we begin from the implicit premise that meaning is the sole glue of the social, all of this remains invisible. On a whim I downloaded The Moral Landscape by Sam Harris this evening. There’s an interview at the link which gives a sense of what he’s arguing. Harris argues that “ethics is an undeveloped branch of science” and that sciences such as neurology and various social sciences can reveal genuine and objective moral truths. In this respect, Harris is a descendent of thinkers such as Epicurus, Epictetus, Lucretius, Spinoza, Nietzsche, Freud, Marx, Deleuze, and many others besides. For him ethics appears to be about living well (and notably he doesn’t restrict this to humans, but to all conscious beings). His thesis seems to be that through neurology and various social sciences we can discover objective facts about forms of practice conducive to these aims and those that tend to undermine these aims. I doubt this will end well, but I’m left wondering how or why he’s wrong. Why is this untrue? We’re all familiar with the normative fallacy and the is/ought fallacy, yet are these genuinely fallacies? Why would it be false to argue that facts about the nature of our being entail truths about how we should live our lives? Increasingly I find myself reading books on my iPad through the Kindle app. Generally these are pleasure books or books that I don’t plan to use in a scholarly way (such as Michael Pollan’s Botony of Desire and The Omnivore’s Dilemma). But really that’s just it: I would like to use my iPad for scholarly purposes. Not only are electronic books cheaper, but I also believe they are more ecologically friendly. It requires energy to ship books. It requires energy to print books. It requires energy to cut down trees. It requires energy to make paper. It seems obvious to me that eBooks reduce our carbon footprint. The problem is that in their current format eBooks are nearly useless for scholarly purposes. Because they don’t include paper pagination it’s impossible to cite them. Surely there is an easy way to solve this problem. If we can provide German pagination for Sein und Zeit in English translations, why can’t we make this standard practice for eBooks? I really wish publishers would get on this.